10 Easy Exercises to try with clients suffering from neurological injuries such as stroke are listed below. The key is to go at a slow pace and imagine the “hand in the mirror” is truly the affected side. Make a fist and then open your hand slowly. Repeat 3 sets of 15 reps.
Touch your thumb to the tip of each finger. Repeat 3 sets of 15 reps for each finger. Turn your palm up and down. Repeat 3 sets of 15 reps.
Pretend to play the piano, pushing each finger on the table one at a time. Continue for 2 minutes. Place a washcloth on the table. Wipe the table in a circular motion, back and forth, and up and down for 2 minutes. Place a water bottle on the table, grasp it with your hand, lift it up 2 inches, place it back on the table and let go. Repeat 3 sets of 15 reps.
Place 5 coins on the table. Pick them up one at a time until they are all in your palm. Place them back on the table, one at a time, using your thumb and your index and middle fingertips. Repeat 5 times. Place a foam ball on the table. Pick up the ball, squeeze it and place back down on the table and let go. Repeat 3 sets of 15 reps.
Place 20 small objects (marbles, poker chips, blocks) on the table. Position a bowl next to the small objects. Place the small objects, one at a time, into the bowl. Repeat 3 times. 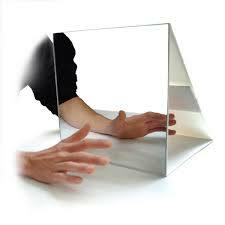 Crawl your fingers along the mirror in various directions (up, down, diagonally) for 2 minutes.